I’ve had lots on my plate the last few weeks, including finally installing Magic Online on my Macintosh and playing in a couple of paper PPTQs for old-time’s sake. While life passed me by as I struggled to 5-0 a competitive league, as much an exercise in beating the program’s hostile interface as besting my opponents, Wizards quietly published pages and pages of brilliant decklists. In this week’s brew report, we’ll do some of those those decklists justice by covering developments in Burn, Zoo, and Rock decks. When it comes to classic Modern decks, it don’t get much classic-er than good ol’ Burn. But lately, some novel spins on the archetype have been making the rounds online—and I don’t mean Burn’s recent re-adoption of Wild Nacatl to beat up on UW players. 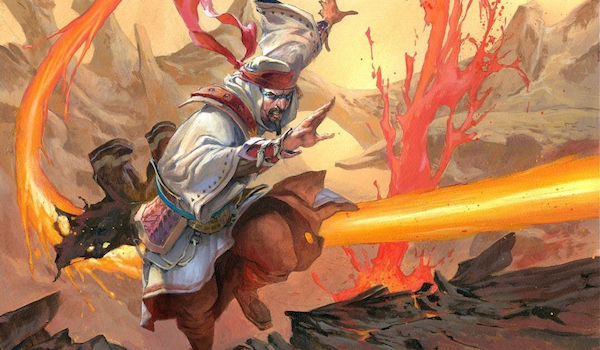 RELEKKAM’s Mono-Red Wizards isn’t an especially obscure deck—it’s even been dubbed 12 Bolt by the likes of Saffron Olive. But man, is it neat! The deck runs red’s most aggressive one-drops, besides of course its most aggressive one-drop, Goblin Guide. In Guide’s place are Soul-Scar Mage and Ghitu Lavarunner, which enable Wizard’s Lightning along with Grim Lavamancer. Damage-by-numbers bruiser Monastery Swiftspear and incidental card advantage machine Bomat Courier round out the creature suite. The deck’s reach is also curious, with Fiery Temper the prime suspect. 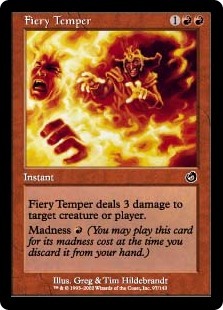 Temper mitigates the drawback of Faithless Looting in what’s essentially a critical-mass deck, letting Mono-Red run the most effective card selection spell this side of Ancient Stirrings. So does the one-of Insult. With an three-lore Flame of Keld, creature sniper Gut Shot becomes a functional Lightning Bolt, too. Flame also teams with Bomat to refill an empty hand. RELEKKAM’s sideboard is just as impressive, featuring Smuggler’s Copter to extract value from small ground guys against green decks while casting madness cards, Young Pyromancer to attack opponents from a go-wide angle, and my old pet card Spite of Mogis to tear apart large blockers. Goblin Chainwhirler seems like an awesome sideboard include for any aggro deck this red-heavy, as it’s rather unwieldy on the whole but clearly insane against Signal Pest, Noble Hierarch, and Lingering Souls. Chainwhirler also simplifies dealing 4 damage to larger creatures in a turn cycle. TANGRAMS’s Bomat Bump deck follows a similar philosophy to the Nacatl-accommodating burn decks, but with a twist: it runs Bomat Courier instead! To support the Construct, the deck trims white, color of clunky two-drops, for black, color of eight Lava Spikes. Mishra’s Bauble also makes an appearance to hide cards from Bomat and buff Monastery Swiftspear free of charge. Out of the side, Dark Confidant also benefits from Bauble. I like TANGRAMS’s decision to relegate Skullcrack to post-board games; it’s the card I’m always least impressed with when I play Burn, although it’s certainly incredible once opponents have brought in their hate cards. Pushed a little closer to the fair side of things, Burn just becomes Zoo, a beatdown deck easier to interact with by virtue of running more creatures. While Zoo’s less of a proven entity than Burn in Modern, some innovative shells have surfaced for this archetype, as well. We’ll start with the most Burn-aligned Zoo deck here. Goyf Sligh is a decade-old archetype that’s never quite made it in Modern. Its premise is simple: take an aggressive red deck and add Tarmogoyf. Goyf does a few things for the strategy, chief among them cleaning up the mess after the deck’s one-drops eat removal and hassling the many decks that, despite Fatal Push existing, still can’t remove it cleanly. XFILE stuck closely to the Goyf Sligh ethos with this list, resisting the temptation to lightly splash white for Wild Nacatl or to mainboard Burn standby Eidolon of Great Revel, which actually shines brightest when chasing one-drops such as these. The benefits? Reliable mana and reliable Atarka’s Commands. All that’s left for us commentators to do is weigh the pros of Goyf over the pros of Nacatl out of a Burn deck. Goyf, of course, is better against Bolt decks, while Nacatl is better specifically against decks leveraging Path to Exile and Fatal Push as early interaction. Goyf also shines when facing down other big creatures such as Hollow One and Gurmag Angler, although the early points of damage from Nacatl can prove equally alluring when they translate into actual wins. In any case, I’m excited to see how this green-guy rivalry plays out. JOHOSO’s 8-Moon is no prison deck. This deck is so Ramunap Red it runs a playset of Incinerate, a card in this format perhaps best explained as a “Lightning Strike analogue.” But did this deck only 5-0 because of lucky Moon draws with Simian Spirit Guide? Or is Harsh Mentor just a sleeper Modern card? One component I’ve heard the new wave of Big Red players talk up is Rampaging Ferocidon. JOHOSO’s only got a single copy in the sideboard, but the Dinosaur still makes an appearance in his decklist. Apparently, its combination of life-taxing abilities is quite potent in a shell that already draws Bolts away from such curve-toppers. My favorite thing about this list is its propensity for killing mana dorks. JOHOSO knows that eight Blood Moons are no good in the face of Birds of Paradise. Forked Bolt and Goblin Chainwhirler execute small green creatures with extreme prejudice, a feat that also clears the way for Goblin Rabblemaster tokens to chew holes in opponents. Slinging burn spells is fun and all, but in keeping with previous editions of the Brew Report, we won’t end the article without unearthing some fair attrition decks. By now, Mardu Pyromancer has established itself as one of the premier midrange decks in Modern, if not the premier midrange deck in Modern. DABIGGESTB sought to challenge its title with Mardu Unburial, a build that omits the deck’s namesake Young Pyromancer for a new one: Unburial Rites. One apparent allure of the Rites plan is extracting more value from Faithless Looting. With all those juicy cards to discard, the draw spell has less of a drawback in matchups where card advantage actually matters, such as in midrange mirrors. With that being said, the cost of including this package includes trimming Bedlam Reveler, another card that dominates mirrors while taking advantage of Looting’s drawback. And Modern’s premier control deck, UW, is known for its many Path to Exiles, which trade off with a Rites target much more evenly than they do with a Reveler. Mardu Unburial still boasts plenty of free wins, both from Lingering Souls (vs. Affinity, Infect) and the Rites package itself. Modern’s not short on decks that scoop to Iona or Elesh Norn. Nahiri, the Harbinger also plays double-duty in this shell as an interactive planeswalker that eventually ticks up to cheat in Rites targets from the deck. Should the game still be in progress after that attack, Looting can discard the fatties all over again and set up a game-ending Rites. My number one issue with this deck is its reliance on the graveyard. Part of what I like about Mardu Pyromancer is that Young Pyromancer gives the deck a competent plan against Rest in Peace. Replacing the Shaman with this package removes that element from the deck. Smallpox is a deck that’s existed in Modern for as long as the format’s been around, but it’s never been so successful. The most popular Pox shell is 8-Rack, a deck championed by Tom Ross that shreds enemy hands and wins with The Rack and Shrieking Affliction. Pox Rock takes full advantage of the deck’s natural urge to run one-mana discard spells by including Dark Confidant and Tarmogoyf, the linchpins of Jund and other BGx midrange decks. If Inquisition into Bob can win games for those players, why can’t it for Smallpox players? This sort of mashup has been avoided in the past because of the potential tension of running real creatures alongside Pox. But in hindsight, that tension can be quelled by just not slamming cards down at random. A stream of additional disruption from Bob or the unmatched clock of Tarmogoyf seem to me like just what the doctor ordered in an otherwise slow-to-win deck. Adding green to Smallpox shells also opens up the sideboard. Thrun, the Last Troll seems hard to cast, but I can imagine it putting the hurt on control decks—at least, until they rip Terminus. More exciting is Tireless Tracker, a card we’ve been seeing crop up in all kinds of green decks of late, even replacing Confidant in many BG Rock shells. Scavenging Ooze, too, is awesome in the resource-depleted game state Pox strives for. 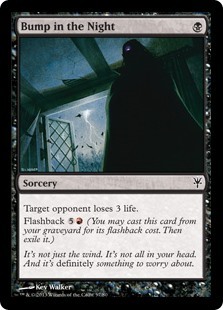 Finally, Maelstrom Pulse gives the strategy a catch-all it’s long lacked in mono-black. That wraps up this issue of the Brew Report. Catch the next one in a couple weeks, when my notepad document of hot decks again becomes too bloated to bear; in the meantime, don’t forget to share the coolest new decks you’ve seen in Modern down below! Can’t quite comment on the brews but it’s really cool seeing you on MTGO. Can we expect some video coverage with commentary with delver/stompy decks? I certainly would love to learn watching you play! You can! As soon as I learn to stop clicking through critical points of my turn!